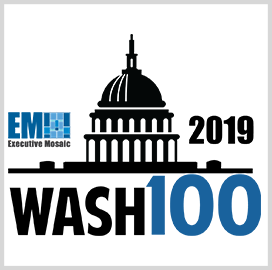 Over 11,500 votes have been cast from the GovCon community to determine the top vote getter in the 2019 Wash100 voting. With the April 30th deadline approaching, voting remains strong with David Wajsgras and John Harris of Raytheon tallying the most votes and recording the biggest impact in the rankings for the week. Tiffanny Gates of Novetta is holding onto first place by 26 votes with Wajsgras in second place and in hot pursuit of the leader. Mac Curtis of Perspecta remains in third place for the second consecutive week as Gates and Wajsgras continue to pull away with only a couple of weeks left to vote. AT&T continues to have a strong presence in the top 10 with Jill Singer still in fourth place, but Xavier Williams dropped from sixth place to eighth place this week. In the middle of the pack, Tony Moraco and Nazzic Keene, both of SAIC, hold strong in fifth and sixth place respectively. John Harris of Raytheon climbed the rankings from ninth to seventh after receiving a strong boost from voters this week. Steve Harris of Dell EMC Federal continues his hot streak and rose to ninth place while Teresa Carlson of Amazon Web Services dropped down to 10th place. Thomas Kennedy of Raytheon, Marillyn Hewson of Lockheed Martin, Gwynne Shotwell of SpaceX, David Levy of Amazon Web Services, Leanne Caret of Boeing and Michael Corkery of Deltek are still threatening just outside the top 10 and are looking to make gains before voting concludes. The Wash100 voting is red-hot heading into the final days. It’s more important than ever to cast your vote before the April 30th deadline. 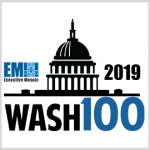 With Gates, Wajsgras and Curtis fighting for first place and other executives making big moves in the top ten, your votes will matter in the rankings to determine the top GovCon executives of 2019.